Hi there, I hope you are well and enjoying your week so far. It’s a speedy visit from me for this week. Here is a card that I made using stamps and dies from Waltzingmouse Stamps (no longer trading, but some of Claire Brennan’s designs are available through Gina K Designs). I also used Memento inkpads in Bamboo Leaves and Espresso Truffle. Versa Magic Dewdrop in Red Brick. The red spot card is from Craftwork Cards, the Kraft base card is a 6×6 card blank that I have embossed with an X Cut Snowflake embossing folder. I also used the MFT Die-namics Inside and Outside Diagnol Stitched Square Die. I have just looked on the Gina K Designs blog and guess what is being released on the 13th of October??!! That’s so spooky, I honestly didn’t know before I started writing this post! Check it out HERE! 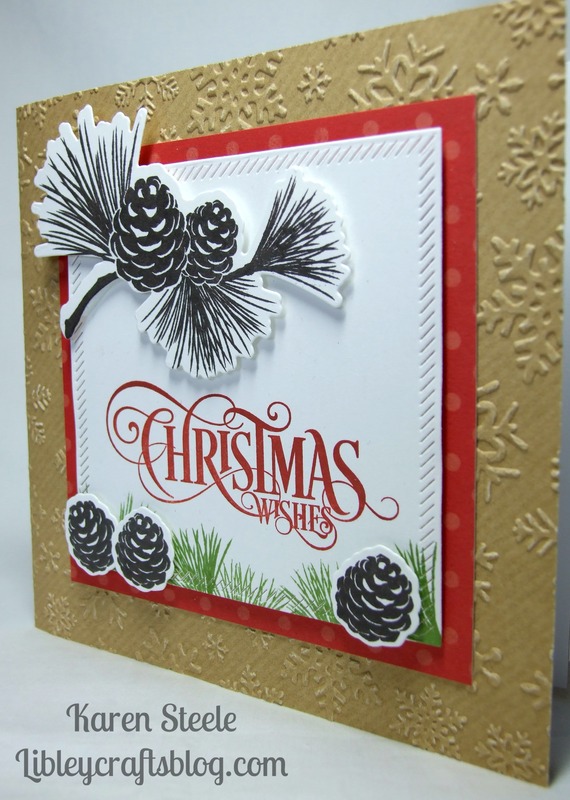 Next > Bokeh Best Fishes…..
Gorgeous Christmas card with the pine cones! Love the embossed background, too! Love the Christmas font stamp. Such a shame cos I loved Waltzingmouse stamps! Lovely Card! Amazing Christmas Card, Karen ! LOVE the script of the saying and the pinecones are great. I love this. Traditional images, but with a modern twist – absolutely super. Also quite inspirational for those of us that cannot colour. It does make me want the stamp!! Hope you have this on Pinterest so other people can get inspired too! Hmm, I might go with a red and Kraft color combo next, inspired by the colors of your card here. Beautiful for Christmas. Love your pinecone stamps! So pretty – I love the color combo – it is stunning! Very pretty Christmas card, Karen! The embossing is beautiful too!